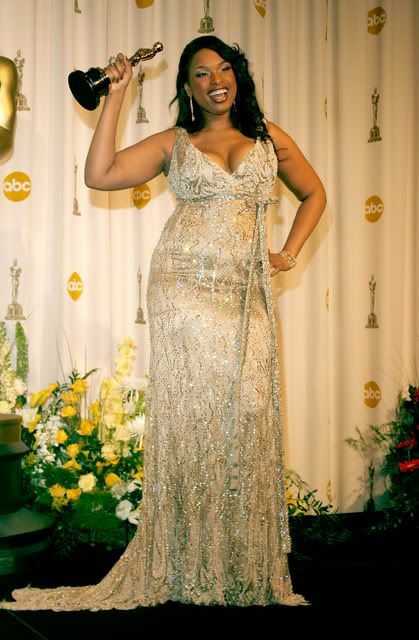 Oh, what a journey it's been for Jennifer Hudson. I'm not talking about her journey from American Idol to the Oscars or whatever. I'm talking about the journey through fug that she took on the night of the Academy Awards. Because a girl totally wants to look like she's wearing something that might have been spotted in the background of the Thriller video on the biggest night of her life. She also totally wants to have the hem of her shorty bolero hit her at the widest spot of her chest, making her look way bigger than she actually is. Oh, also? If she could find a color that totally makes her look washed out and boring? That'd be great. What's up with ALT? Did Anna Wintour crack him over the head with a thigh-high boot during a confrontation at the office, thereby knocking the chic out of his head? Did spending a lot of time with Jennifer Hudson lead him to secretly, passionately hate her, thereby leading to this act of sabotage? Does he really just love lame? So much better, no? This is what she should have worn to walk the red carpet. She looks awesome in this. The brown number might have been more comfortable, sure, but you put on something LESS formal for the after-parties, right? Like, when I was in high school, we all put on flannel shirts over our prom dresses for the after-party so we could be comfortable while we talked about how totally rad Pearl Jam was. We didn't wear the flannel to the prom itself. Not to mention the fact that I think it's kind of insane to change for the party -- are people shimmying into and out of things in the limo? Because that seems like a lot of work for an evening where you should have started out the night looking your best, anyway. Not like an extra from a long-shuttered Star Wars musical. Not that I blame J Hud for that fiasco, entirely - when you're in Oscar de la Renta with Andre Leon Talley and they're telling you that the cropped shiny thing is the way to go, you probably figure they know what they're talking about. But let this be a lesson to us all. When your instincts tell you to reject a tin-foil cardigan, listen to them, or find yourself telling the limo driver to avert his eyes from your Spanx.